Artists have created art on walls as long as we have been living in communal groups. From caves, churches, palaces and government buildings, artists have been creating expressions of the current culture with their creative individuality. “Murals in History” will share mural creations from around the world, throughout human history. “Fresco of the Dolphins” in Knossos Palace, Crete, Greece. 1800-1400 b.c. This fresco is a fabulous example of early Minoan Painting, very interesting for its precise representation of the natural world without any human presence. Located in the Bath Hall -where such aquatic motifs were very suitable-, the “Fresco of the Dolphins” is an authentic masterpiece, for its undeniable decorative value and for its remarkable effect of movement. The restoration of the frescoes in the Knossos Palace at the beginning of the last century received criticism for the bright colors employed, yet the final result is probably close to the original aspect of the paintings, created at the heart of the Minoan splendor. A retelling of "Enlik-Kebek", 1965 , outside of the Hotel Almaty in Kazakhstana. A Kazakh folk tale about star-crossed lovers from different tribes, with a similar plot line to Romeo and Juliet. The mosaic storybook begins with the two lovers meeting on horseback and ends with their happy union after enduring trials and tribulations on the way. The first Soviet mosaics appeared in the 1930s, adorning the Stalinist neo-classical train stations, theaters and the Moscow metro. It then fell out of fashion in the 1950s under Nikita Khrushchev, but the monumentalist art aesthetic reappeared under Leonid Brezhnev in the late 1960s and 1970s. In the late Soviet period, any new public building automatically had 5% of the budget earmarked for “artistic elements.” Many murals were created in the "Stans": Kazakhstan, Kyrgyzstan, Tajikistan, Turkmenistan and Uzbekistan. Though mosaics can last well with some help, they are left to disintegrate because people associate them with a fallen political system. Many of these murals are genuine art and were created by talented, experienced artists. “The Crucifixion”,by Jacopo Tintoretto. In the Scuola Grande di San Rocco, Venice, Italy. 17x40 feet, 1565, oil on canvas attached to the wall. This is one of Tintoretto's most remarkable achievements. This is the largest, grandest and most dramatic of an entire patchwork of biblical scenes by him, which adorn the walls and the ceilings of this 16th-century scuola in Venice. The painting focuses on the dramatic moment when the Cross is being raised upright. A notable critic wrote of the stupendous Crucifixion: "Surely no single picture in the world contains more of human life: there is everything in it, including the most exquisite beauty." His work is characterized by his muscular figures, dramatic gestures and bold use of perspective, in the Mannerist style. To help him with the complex poses he favored, Tintoretto used to make small wax models which he arranged on a stage and experimented on with spotlights for effects of light and shade and composition. He is a painter of the Venetian school and one of the most important artists of the late Renaissance. Increasingly concerned with the drama of light and space, he achieved a luminous visionary quality in his mature work. Oil on canvas, approx 6x10 feet, 1939, originally installed in library, Talladega College, Alabama. One of six monumental canvases created for the new library at Talladega College. The first three paintings, completed in 1939, deal with the Amistad mutiny and its aftermath as emblems of heroic African protest against slavery and New Englanders' support of the rebellious slaves' cause; the second trio, completed in 1942, celebrates the opening of Talladega College and the construction of the library itself as paradigms of black Americans' progress since the Civil War. Woodruff studied at prestigious art institutes in the US. He spent time in Paris and he went to Mexico to study with Diego Rivera. The masterful, complex composition is full of movement, color and glistening bodies. He made it clear in the portraiture that these are distinct individuals. Woodruff has a rightful place among America's pre-eminent social realists of the 1930s and early 1940s. This beautiful mural is in the Buddhist Monastery Hemis, in Ladakh ("land of high passes") , a region in the Indian state of Jammu and Kashmir . The technique is most likely "Fresco Secco" (Fresco-secco is a wall painting technique where pigments mixed with an organic binder and/or lime are applied onto a dry plaster. The paints used can be casein paint, tempera, oil paint, silicate mineral paint.) They also would be painted on cloth and hung over a wall. The care and attention to detail is remarkable, as well as the exquisite colors. Murals not only honor the Buddhist teachings, they assist in communicating ideas, concepts and stories. It's interesting to compare a Buddhist mural to one of the Italian Renaissance. The Buddhist artists have no interest in imitating "real" 3D space. With a spiritual point of view that all time happens at once, then it makes sense. There are thousands of murals in all of the monasteries from northern India through Tibet, Nepal and into China and Korea. Many have survived for centuries in the dry climate of the Himalayas. Veterans Memorial Coliseum Murals by Paul Coze. Approximately 15’x30’ oil on canvas applied to the wall. In honor of the Annual State Fair he is responsible for many public art creations throughout Phoenix created during the 1960’s. Paul Coze created the well-known Phoenix mural in Terminal 2 at Sky Harbor Airport using 52 different materials. The murals in the Coliseum depict a variety of scenes of Southwest culture as well as this scene of a circus act. His style was influenced by Cubism. Paul Coze is an indelible part of Phoenix history and unfortunately, many of his public works have been destroyed. A 10 panel, room-sized mural call "America Today", 1931, egg tempera with oil glazing over Permalba on a gesso ground on linen mounted to wood panels. This was originally created for the boardroom of the New School for Social Research, a center of progressive thought and education in Greenwich Village. This is the largest panel is filled with enormous machines that embody modern industrial might. Eight of the panels depict life in different regions of the United States: the South, the Midwest, the West, and New York. Benton created "America Today" in a dynamic, restlessly figurative style that reflects his study of sixteenth-century European painting, especially the style known as Mannerism. But the exaggerated, pantomimed gestures and expressions of the figures he painted also recall early twentieth-century film, among other popular sources. Also stagelike in character is Benton's depiction of architecture, particularly the dam in "Instruments of Power", a facade that suggests his response to Italian painter Giorgio de Chirico. 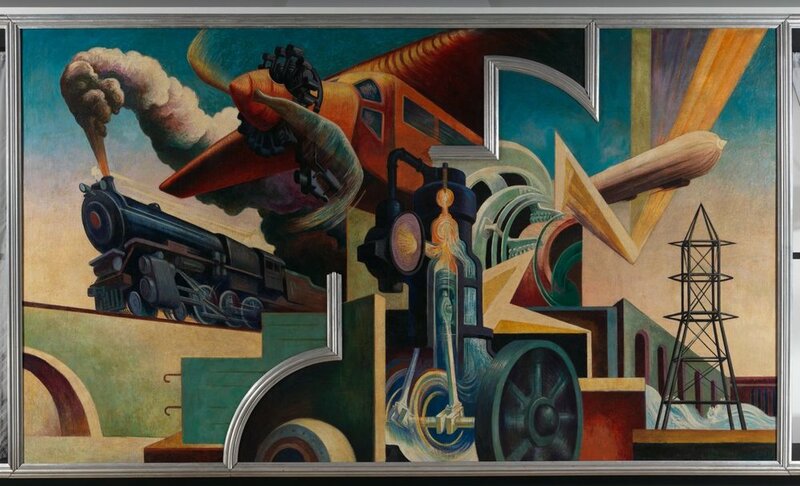 Among the mural's most distinctive features are the aluminum-leaf wood moldings, which not only frame the entire work but also create inventive spatial breaks within each large composition. The famous Abstract Expressionist artist, Jackson Pollock, was a student of Benton's. Permanently installed oil on canvas, 1884 (approx. 16x20 ft). One of three large murals in the stairway, Palais de Beaux Arts, Lyon, France. Pierre Puvis de Chavannes, 1824-1898. Puvis de Chavannes was one of the most prolific of the government supported painters of the Second Empire and the Third Republic, even obtaining one of the most prestigious mural commissions in the United States, for the grand staircase of the Boston Public Library. Puvis de Chavannes' work is seen as symbolist in nature, even though he studied with some of the romanticists, and he is credited with influencing an entire generation of painters and sculptors, particularly the works of the Modernists. He uses classically-inspired allegorical themes which invoke a timeless past and Renaissance ideals. Yet, he stylistically collapses space and sometimes thwarts those Renaissance “rules”, giving his work a modern look. Arena (Scrovegni) Chapel, Padua, Italy, c. 1305, Fresco, (approx. 4x5ft) by Giotto (Giotto di Bondone . 1267 – January 8, 1337) The Italian painter and architect from Florence painted the interior of the chapel with a cycle of 37 images of which this is one. This is his most influential work and considered to be an important masterpiece of Western Art. Giotto was "the most sovereign master of painting in his time, who drew all his figures and their postures according to nature", to quote a famous chronicler of that period. This is still considered the Gothic period yet notice how well shaded and solid the figures look, moving away from Medieval flatness. Giotto was a pioneer in observing the human figure from life and depicting it with solid volume as if there is a real body underneath the clothing. Take note of the attempt at perspective in the architecture. The system of linear perspective had not been developed and Giotto is on his own as far as how to show architecture and delineate realistic space for his figures. "The School of Athens" by Raffaello Sanzio da Urbino. Approximately 17' by 25' fresco painting, completed in 1511 in the Apostolic Palace at the Vatican in Rome, Italy. Painted during the High Renaissance, this mural is an excellent expression of it’s ideals. Representing Philosophy, with Plato and Aristotle as the central figures, this mural expresses the renewed interest in ancient Greek philosophy. Raphael was only 27 when he completed this work, showing a remarkable command of the human figure. Notice the excellent use of linear perspective to create a believable space. The development of linear perspective is a hallmark of the Renaissance period. The educational content of Murals in History has been provided by Lucretia Torva.